If you haven’t been to the newly renovated National Galley of Ireland yet, then here’s another great reason to go: there is a Mark Rothko proudly hanging in the Millennium Wing, which to the best of my knowledge is the very first time an original Rohtko has ever been on public view in Ireland. CORRECTION: Donal Fitzpatrick informs me on Twitter that there was a Rothko entitled The Green Stripe on view in IMMA in 2010. Black and Red on Red (1963) is on a temporary loan from a private collection, so it will be worth your while making it your business to see it sooner rather than later, as the Gallery are unsure about the duration of this loan. Rothko was an American painter of Russian Jewish descent who is frequently cited as one of the leading lights of abstract expressionism, although he repeatedly refused to be categorised. He has an absolutely enormous cult following, and is undoubtably one of the most popular artists of the late 20th century. 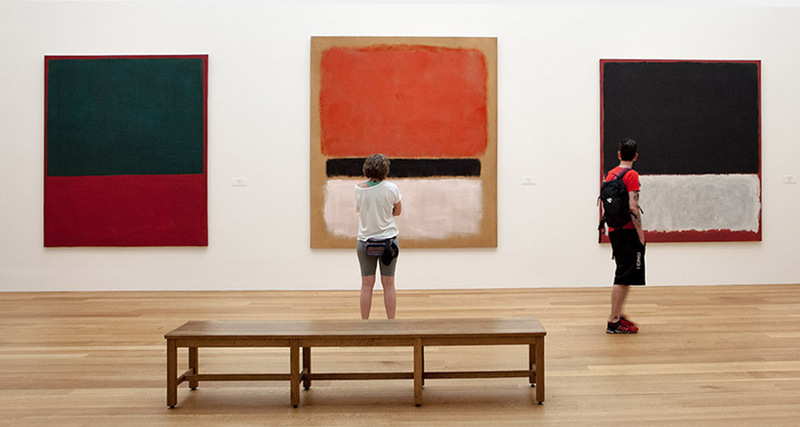 If you haven’t seen a real Rothko for yourself up close, you might be wondering what all the fuss is about because photographs of his huge painting often look like run of the mill abstract art. However, viewing them truly can be a magical and engrossing experience. Blocks of colour appear to quite literally float off the canvas and occupy a room like no other art work. I’ll never forget the first time I saw a few Rothkos hanging/floating in room 921 in the Met Museum in New York, which contains a breathtaking selection of abstract expressionist masterpieces overlooking Central Park. I’ve regularly been a mediative pilgrim to the Rothko room in the Tate Modern, and I was overjoyed to see another huge one recently in the Guggenheim de Bilbao. Black and Red on Red in the NGI is a much smaller work, but it still packs Rothko’s familiar sucker punch to the head and heart. Photography of it is not permitted for copyright reasons, so you just have to see it for yourself. If you want to listen to a very illuminating piece about Rothko, check out this Wbur feature on a new exhibition at the Boston Museum of Fine Art entitled Seeking Stillness. It suggests how art can be such a tonic for the times. From my brother’s blog here is a post on, as he says, another reason to visit the National Gallery of Ireland!